All children arrive in the world untainted and open. They are sensitive to every influence, behaviour and emotion around them. This can be seen in their often uncanny ability to sense the unknown, their natural responsiveness to the feelings of people around them, and their sponge-like ability to absorb language and information. There is a spark of the divine in children that needs nurturing. A good home environment and contact with positive people, ideas and experiences gives them a good start in life. The flip-side of children’s openness is that their sensitivity also makes them vulnerable. Even in families living in physical safety and material comfort, children can become lost. Parents who lack self-awareness pass on to their children their own expectations, frustrated ambitions, anxieties and dissipation. At the extreme, living in harsh circumstances where the grown-ups are frightened, themselves broken by material hardship, or undergoing intense emotional and mental suffering can plunge children into darkness and negativity. 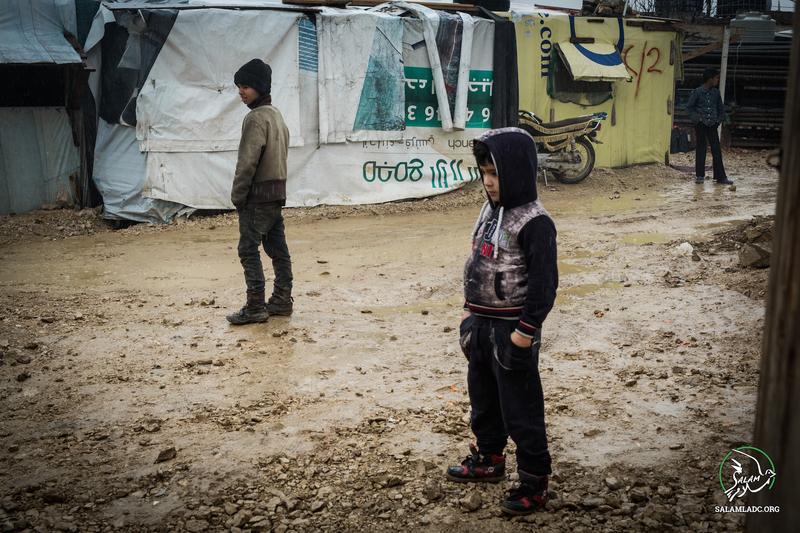 In Bekaa valley in Lebanon, more than 800,000 refugees from Syria live in crowded tents and half-finished buildings, often nine or ten people inhabiting a single room and surviving on less than four dollars a day. These are people who have recently fled war, experiencing extreme and overwhelming events: violence and death; separation from their loved ones; loss of safety, possessions and home. In the circumstances, parents who are themselves in pain all too often pass on the effects of their own trauma and hopelessness. Refugee life in all its despair comes out in the children’s behaviour as violence and bullying, nightmares and bedwetting. From a mother who throws stones at her son to a father who sends his daughters out into the streets to sell packets of tissues, parents are failing as role models. Other teachers and mentors are in short supply as the majority of Syrian refugee children in Lebanon lack access to schooling and opportunities. Yoga can help these refugee children cope with their experiences by releasing the emotions associated with the extreme and overwhelming events of their lives. Besides bringing balance and improving learning, yoga can nurture their inner confidence and ability to resolve conflicts and monitor aggression. It can also give them a glimpse of well-being and happiness that offers hope. In various yoga classes for refugee children held by Tools for Inner Peace in Bekaa valley since January 2017, the children have intuitively understood the value of yoga, eager to participate and learn. After just a few classes, one ten-year-old girl described how she had been teaching everything she had learned to her mother and sisters, wanting them to feel as good as she felt from the yoga. To make yoga more widely available to refugee children in Bekaa valley, we organised a Yoga for Kids training together with RYE UK (Research on Yoga in Education UK) for the local staff who work with them. Most of the participants were social workers, Syrian and Lebanese, who try to provide these children some measure of psycho-social support. They do this through different methods ranging from play to music and art to try to help traumatised children express themselves and let go of painful emotions. The first three days of the training were held in October 2017, after which the participants were encouraged to practise what they had learned. By the time we met for the second half of the Yoga for Kids training in April 2018, several of the social workers had already tried out kids’ yoga techniques taught during the first half of the training and found the children they worked with highly responsive to the yoga. The RYE techniques are loosely framed around the first six limbs of Patanjali’s ashtanga yoga. They incorporate games and methods for children to learn to cooperate with others and come together as a group (yama); a focus on positive thoughts and maintaining a healthy body and mind (niyama); developing awareness of the body and improving confidence, often through stories that make use of yoga postures (asana); learning how to breathe properly and use the breath to bring calmness (pranayama); developing inner senses and relaxation (pratyahara); and improving memory and concentration (dharana). Some of the favourites among the group of trainees were story-based sessions about venturing into a jungle, visiting a zoo, and launching a rocket into space to deliver laughter parcels. One of the participants developed her own yoga story about entering an enchanted forest in search of unicorns, another about using a diving bell to explore the bottom of the sea. In their work with kids, participants were also using various storylines to get the children to stretch and bend, exploring the seven positions of the spine, and a relaxation practice breathing in the colours of a rainbow. Beyond using the yoga techniques in their work, the participants were grateful for the opportunity to experience yoga for themselves. Social workers can become overwhelmed from having to confront the suffering and pain of others from one day to the next. A week after the end of the second training, one of the participants reported that she had felt “like a butterfly” in the days after the training and had been inspired to practise yoga every morning at home: “I wish the training was not just for three days but every day.” Another described as her most lasting impression an experience of completely letting go of awareness of her body and the outside world and the total relaxation that she felt for the first time in the deep relaxation practice of yoga nidra. The success of this first training has encouraged us to develop ideas for further opportunities to share Yoga for Kids techniques with refugees themselves and those working for their well-being. 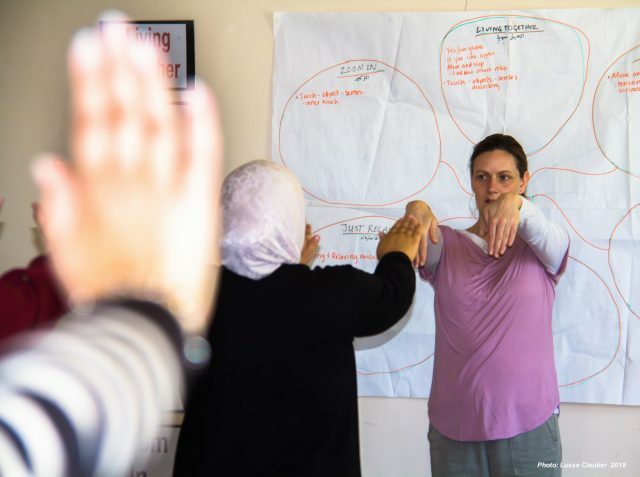 Future plans include an intensive training for teenage girls living in refugee settlements in the Bekaa valley region, as well as further training of social workers and eventually also Syrian and Lebanese yoga teachers to help reach larger numbers of children in need. So inspiring to read of your work here. It sounds wonderful. Thank you.